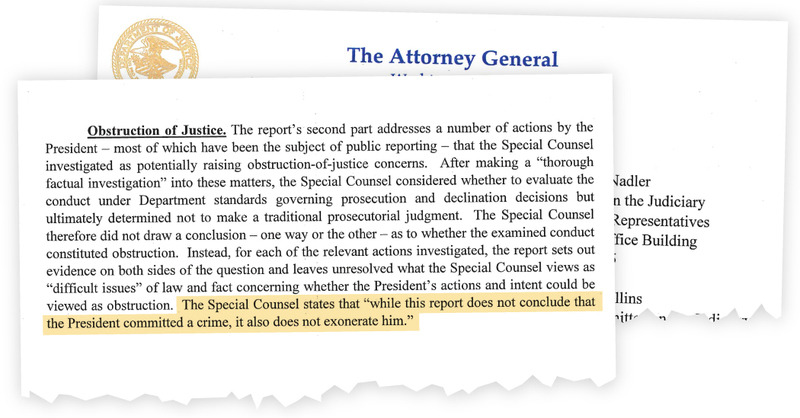 The second part of the report deals with a series of acts by the President – most of which were the subject of public reporting – that were examined by the Special Counsel as a potential concern Concerns about obstruction of justice. After a "thorough factual investigation" into these matters, the Special Adviser considered whether to judge the conduct according to the standards of the Department of Law Enforcement and Decline Decisions, but ultimately decided not to make a traditional verdict of the Procuratorate. The Special Adviser therefore did not conclude, in one way or another, that the behavior under investigation was an obstacle. Instead, for each of the relevant measures examined, the report presents evidence on both sides of the question and leaves open what the Special Adviser sees as "difficult issues" of the law and the fact that the president's actions and intentions could be considered an obstacle. The Special Counsel states, "Although this report does not conclude that the President has committed a crime, he does not relieve him." In doing so, we noted that the Special Adviser was acknowledged that "the evidence does not prove that the President was involved in an underlying crime in connection with the interference of Russian elections", and That the absence of such evidence, while not crucial, would impede the President's disability as a result of disability, would require the Government to prove beyond any doubt that a person who has acted with corrupt intentions and has obtained sufficient protection Measures involving a pending or intended procedure, in a collective act of the President In the public view, the report did not identify any acts that, in our discretion, constituted a hindering behavior that had a connection A pending or contemplated procedure involving corrupt Intentions was carried out who, according to the principles of the US Attorney General's Office, who have indictment decisions, must be unequivocally proven to establish an offense to the Justice Block.